Dual Display Thermo-Hygrometer: This unit is designed for either desktop or wall mounting and measures 2.5" x 5.3" x 0.6". Humidity-Temperature Pen: The Humidity/Temperature Pen is compact and portable. It is useful to monitor the humidity and temperature in laboratory and display areas. Memory Hygrometer-Thermometer: This unit is microprocessor based for fast and accurate measurements with simultaneous display of temperature and humidity. 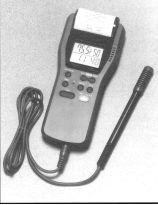 Min-Max Thermo-Hygrometer: Hygrometer with temperature readout and dual Min./Max. memories. Minimum and maximum memories permit air condition to be monitored overnight, during weekends or virtually any time period. Miniature Thermo-Hygrometer: This is the greatest little Thermo-Hygrometer you will ever find. This unit measures 2" wide by 1.5" tall and only 1/2" in thickness. Printing Thermo-Hygrometer: Our Printing Thermo-Hygrometer is ideal for both monitoring and providing a permanent printed record of relative humidity and temperature with time-of-day/month stamp.